"We can't want this more than the parties want it." Through two U.S. Administrations, this has been a constant refrain from U.S. officials discussing peace between Israel and the Palestinians. Yet wanting it more than the parties may be exactly where the Obama Administration finds itself Thursday after the Arab League endorsed Palestinian Authority President Mahmoud Abbas' preconditions for entering direct talks with the Israelis. Despite strenuous U.S. efforts to cajole him into unconditional direct talks, the Palestinian leader is insisting on written guarantees that Israel will halt all settlement construction in the West Bank and East Jerusalem, and that the basis of a peace agreement to be negotiated at such talks will be Israel's borders from before the 1967 war. Israel's Vice Prime Minister Silvan Shalom on Wednesday declared the Palestinian preconditions "impossible," and Prime Minister Benjamin Netanyahu warned that his government would collapse if he tried to extend his partial settlement freeze beyond its Sept. 26 deadline. Because Palestinian skepticism of Israel's intentions runs so deep, Abbas could not even count on an endorsement by his own Fatah movement to participate in indirect talks under the auspices of the Obama Administration; instead he had to secure a mandate from the Arab League earlier this year. Nothing that transpired in the indirect talks mediated by U.S. envoy George Mitchell has given Abbas any confidence that direct talks will yield a credible agreement. Palestinian reticence is grounded in a well-founded belief that Netanyahu has no intention of offering what the Palestinians consider their minimum requirements for a credible peace; indeed, Netanyahu has made clear that he'll expect the Palestinians to settle for less than the terms offered by former Prime Ministers Ehud Barak and Ehud Olmert, in 2000 and 2008 respectively, both of which were rejected by the Palestinians as too little and by Netanyahu as too much. The Palestinian leadership believes Netanyahu is not serious about a peace agreement, and is looking to the U.S. to pressure Israel into making concessions it is unlikely to make willingly. They're leery of open-ended, ill-defined talks that create an illusion of progress and alleviate pressure for U.S. intervention  all while further enfeebling the already diminished Palestinian leader in the eyes of his own people. 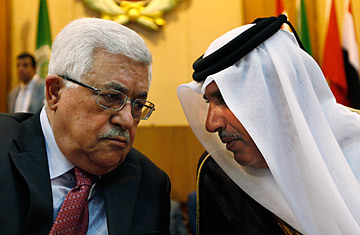 That's why Abbas, backed by the Arab League, is setting conditions for coming to the table. Netanyahu, by contrast, has pushed hard for direct talks with no preconditions, although it's unlikely that he believes such talks can produce an agreement acceptable to both sides  if that were true, he'd have no trouble coaxing Abbas to the table. The Israeli leader is under no domestic political pressure to produce a peace deal, and his government believes Abbas' diminished political status makes him incapable of delivering a binding agreement. Netanyahu's top aides also scorn the idea that an agreement to end the conflict can be reached within the next two years. The only pressure on Netanyahu to talk to the Palestinians, in fact, comes from the U.S., and he has proved adept at walking that pressure back to within his comfort level. The Israelis are well aware that to head off pressure for the U.S. to take a more direct role in shaping the terms for peace, they need to demonstrate that there's at least a continued process between them and the Palestinians. For its part, the Obama Administration's own motivation in pressing for direct talks is unclear, particularly at a moment when the gulf between the two sides makes reaching agreement highly unlikely. Netanyahu treats talks with the Palestinians as the beginning of a process that ought to be given years, with no reference to the two decades of peacemaking that preceded it (most of which he opposed). Abbas and the Arab League will only countenance talks on a limited timeline designed to achieve a final agreement based on previous negotiations. Forcing the parties together in direct talks will put the Israelis and Palestinians on the spot, but if they can't agree it will also put the U.S. on the spot. "These discussions are bound to expose just how large the gaps are between Israel and the Palestinians, and who is serious about reaching an agreement and who isn't. Does the President really want such a moment of truth this fall ...?" wrote former longtime U.S. Middle East peace negotiator Aaron David Miller on Thursday. Direct talks between Netanyahu and Abbas may simply clarify that the two-state solution to the conflict that Obama has made a cornerstone of his foreign policy is unlikely to be achieved unless the U.S. is willing  in conjunction with the wider international community  to put a deal on the table that neither side would willingly take if left to its own devices. Such an agreement would likely involve painful compromises for Israel on Jerusalem, borders and settlements, and painful compromises for the Palestinians on refugees. But the Administration's growing reluctance, in the face of domestic political criticism, to put pressure on the Israelis, may make an impasse in direct negotiations an uncomfortable moment for Obama. And if it becomes clear that negotiations are going nowhere, the prospects for confrontation on the ground are likely to grow. See pictures of West Bank settlements. See pictures of Jerusalem, a divided city.